After a short break, Pastinthepresent.net returns. In my last post I was in Israel so, now back in London, it’s appropriate that I kick things off again today by tracing Jewish heritage across the capital. I’ve had a fascinating day visiting the oldest surviving synagogue in Europe, exploring the Jewish Museum (in Camden) and also the sites of institutions harking back to the wave of mass Jewish immigration in the 1800s. Like many of the groups of people that have settled in London over the centuries, the story of Jews arriving in our capital is a fascinating one. The first evidence for their existence comes from aftermath of 1066 when William I brought Jews over from Rouen. Christians weren’t allowed to lend money, so many Jews performed this much-needed role. Running operations which were as controversial as payday loan companies like Wonga today, the moneylenders became very rich through charging exorbitant interest rates. 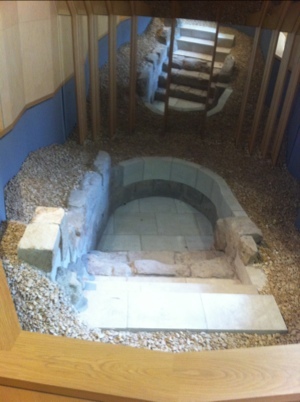 Fascinating traces of Jewish inhabitants have been found in streets in the City like Old Jewry (in 2001 a 13th-century Mikvah, or Jewish ritual bath, was found and has now been reconstructed in the Jewish Museum). But tensions grew, with Richard I banning Jews at his coronation in 1189, and, in 1250, Edward I issued an edict forcing all Jews to leave England. For over 350 years years there were officially no Jews in England. But many did in fact remain, holding respectable jobs, while telling the outside world they had converted to Catholicism. When they outgrew that, Nevis Marks synagogue was built, officially opening in 1701. 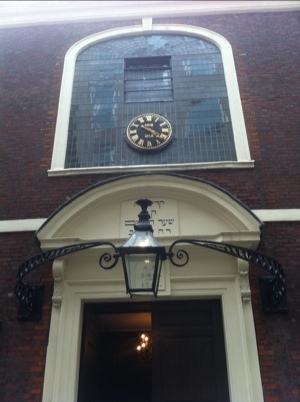 It is the oldest surviving synagogue in Europe. Visiting today, what I found most surprising is that it was built by a Quaker, Joseph Avis, who had worked with Sir Christopher Wren and was part of the team building 51 new churches in the aftermath of the Fire of London. These circumstances help to explain why the building has the partial appearance of one of the churches of the time, but with essential features such as the Ark for the housing Torah. The rather uncomfortable pews are made of English oak and date to the buildings opening 1701. Sir Moses Montefiore, who made his fortune in the City and became a great philanthropist, was a member of the congregation. His name became very familiar to me during my recent visit to Israel as he was essentially the founder of modern, greater Jerusalem. He encouraged poor people living within terrible conditions within the city walls, where cholera was rife, to move out to new homes he was constructing in suburbs. And he built windmills in a bid to smash the cartels that were preventing flour from being affordable for the masses. Montefiore was knighted by Queen Victoria for his efforts of working with the different faiths and today at Nevis Marks synagogue his seat is roped off. People allowed the privilege of sitting in the spot have included Prince Charles and the Duke of Edinburgh, plus Jewish Lord Mayors at special services following their inauguration in the City. Today, the Sephardims have five synagogues in England, following the waves of people who have moved into the suburbs thanks to better transport. But they weren’t the only Jews arriving in London in the 17th century. The Sephardims were soon followed, and outnumbered, by the Ashkenazi who originated from Germany and Poland. Fast-forward to the 1880s and Jewish immigration to London drastically picked up pace as some two million people fled pogroms in Russia and Poland of which up to 120,000 settled in Britain (the majority in London’s Spitalfields and Whitechapel, not far from where they disembarked at the docks). As I’ve written before, the East End was transformed by Jewish immigration in a similar way as it had before by Huguenot refugees. Shops selling kosher food and other goods were opened while posters and newspapers were printed in Yiddish. Most Jews arriving in the East End worked long hours and poor pay in tailoring, but others laboured in trades manufacturing goods ranging from furniture to boots. With so many people living in such cramped spaces, living conditions declined over the course of the 1800s. 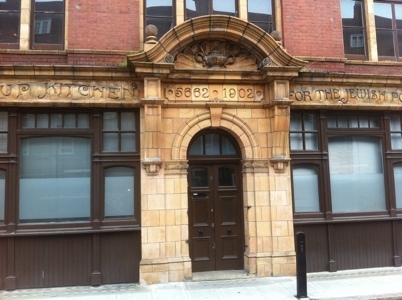 But what’s fascinating today is to discover the response to poverty, like the formation of ‘the Soup Kitchen of the Jewish Poor’ (now luxury apartments). Walking from the City to the East End, stopping at a few synagogues along the way, is a wonderful way of tracing the story of the Jews in London. 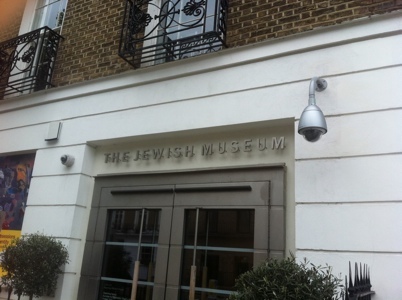 But that process of understanding is enhanced through a visit to the Jewish Museum in Camden. Over four floors the complete story of Jews in Britain is brought to life with art, artefacts and displays from the last one thousand turbulent, but colourful years. My journey today on foot ended near Liverpool Street station, but as the museum pointed out, that wasn’t and isn’t the end of the story. By the end of World War Two as homes in the blitzed East End lay in ruins, many Jews were on the move again. The advent of better transport allowed them to move away from the dirty slums to the new suburbs. Many headed up the Northern Line to the likes of Golders Green and Hendon in north west London or Hackney and Tottenham in north east London. But for me, that adventure into the suburbs will have to wait for another day.